“The Addams Family” premiered on Friday, Sept. 18, 1964, at 8:30 p.m. on ABC. 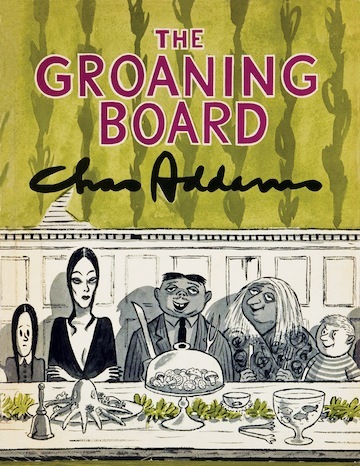 “The Addams Family” was based on macabre cartoons by Charles Addams published in The New Yorker magazine. The cartoonist had been featuring the characters since, roughly speaking, 1938 — little by little, they coalesced into something resembling a family — but he never named them. 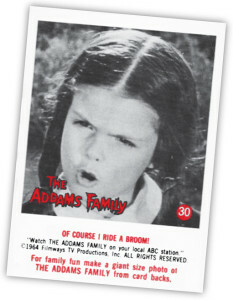 As producer David Levy developed the show for TV, he prevailed upon Addams to finally christen the characters. Likewise, certain aspects of Addams’ characters were tweaked, tightened or fleshed out. 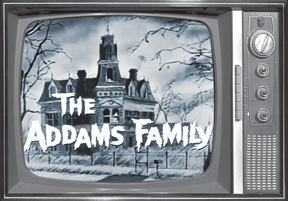 In the cartoons, Addams placed his oddball family in a dark, cobwebby, dilapidated house; on TV, the Addams homestead seemed more Victorian, more eclectic, more tinged with old money. 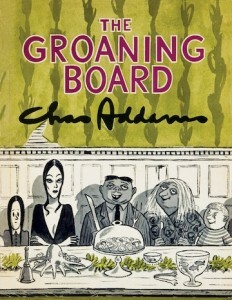 Simon & Schuster’s Charles Addams compilation “The Groaning Board” (1964). John Astin played patriarch Gomez Addams with a lusty zeal, rolling his eyes, brandishing his cigars and slobbering all over his wife if she uttered but one syllable in French. Carolyn Jones played Morticia, a dark temptress with saucer eyes in a tight black dress with intriguing floor tentacles that gave her, to quote the Big Bopper, a wiggle in her walk. Jackie Coogan — the title urchin in Charlie Chaplin’s 1921 masterpiece “The Kid,” and a former Mr. Betty Grable — played Uncle Fester, who had the pallor and raccoon eyes of a shut-in. Add to that Blossom Rock as withered hag Grandmama, Ted Cassidy as Frankensteinian butler Lurch, and Ken Weatherwax and Lisa Loring as the Addams’ deadpan kidlings Pugsley and Wednesday. The catchy theme song by Vic Mizzy — complete with the cast’s finger-snapping — was the cherry on top. 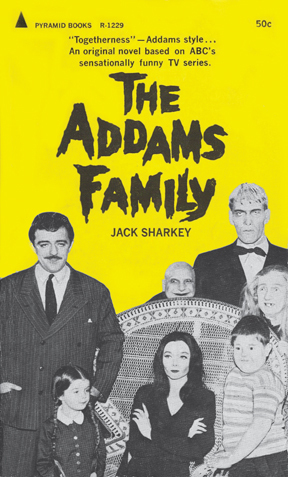 Pyramid Books’ first of two “Addams Family” novelizations (1965). John Astin on creating the role of Gomez Addams: “Charlie (cartoonist Charles Addams) gave us about a paragraph to work with. There wasn’t a heck of a lot, except for suggestions of names for that character. He recommended either Repelli or Gomez, and we chose Gomez. David Levy, the creator of the series, named some of the other characters. It’s really to David that we owe the whole concept of ‘The Addams Family.’ The title, I recall, was David’s idea originally. So I embarked upon creating this character. I decided, with David’s approval, that Gomez would be a character that was romantic and passionately in love with his wife. On that, Carolyn (Jones, who played Morticia) and I were able to build a great many things. 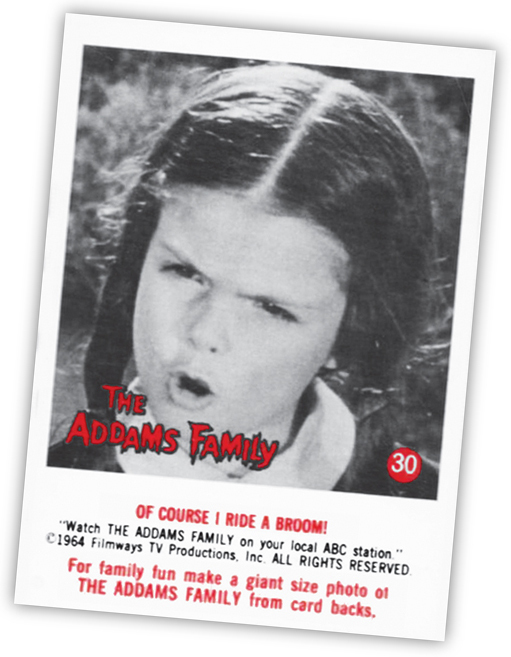 Lisa Loring as Wednesday in card #30 of the “Addams Family” trading card set by Donruss (1954). Loring said she was unfazed by the use of her likeness on “Addams” memorabilia. “Monster Mash” also features four pages of “Addams” memorabilia. The Uncle Fester hand puppet (manufactured by Ideal in 1964) shown above right is the manifestation of a childhood memory. A school buddy had one, and I never forgot the exquisite sculpture of Fester’s face. (I still can’t describe Fester’s expression on the puppet. It’s as if he is pleased with something horrible that just happened.) While working on “Monster Mash,” the memory of the Fester puppet unexpectedly came back, and I made it a mission to include it in the book. I finally had to buy one on eBay for 85 bucks. Worth every penny.